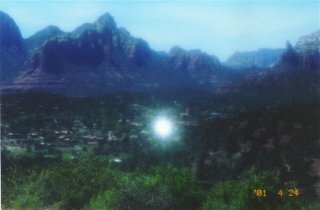 One my favorite places for encounters is Schnebly Hill, a famous Vortex, in Sedona. I spend many hours in trance and meditation at that special and sacred site. I saw this "Ball of Light Orb" and quickly caught this shot. They usually appear only for a moment, then disappear.